Good morning everyone, I hope your Thursday is off to a awesome start, if anything the weekend is right around the corner and thats good enough for me! In case you missed it, last week I launched the bariatric nutrition coaching/consulting service part of my business. It’s been a goal of mine since I made the decision to further my nutrition education and pursue my Nutritional Therapy Practitioner (NTP) certification and obtain my speciality certification as a Bariatric Nurse (CBN). As you know, if you follow me on Instagram, I’m passionate and firmly believe that real, whole food based nutrition, when it comes to optimal health and wellness for weight loss surgery patients is everything. It can be the difference in breaking through stalls, maintaining your weight loss, controlling cravings and feeling so much better overall. If you are interested in reading about the new service that I offer you can check it out here or under the “work with me” tab here on the blog and if you have any questions don’t hesitate to email me or leave a comment at the end of this post. Today I have a quick and tasty recipe for you that would be so delicious with fresh veggies, spread on flatbread, pita or on crackers but believe me, this tzatziki sauce tastes even better when you dip the Greek meatballs that are coming your way soon! I hope that you will add this to your recipes to try if you can tolerate small amounts of dairy in your diet. My goal is to come up with a equally tasty dairy free version for those of us that find it difficult to enjoy dairy in this form but until then I hope that you love it and will let me know so by leaving a comment at the bottom of the page. Have a great day! Drizzle of high quality olive oil. Grate your cucumbers and let them sit on a few paper towels to absorb water from cucumbers. Add the sour cream and yogurt into a mixing bowl. Chop your dill and chives and add to the mixing bowl. Zest your lemon, juice and add to mixing bowl. Using a microplane, grate the garlic into the bowl. Add salt and pepper to your desired taste, fresh cracked black pepper I find has the best taste. Before you add in the shredded cucumber, squeeze the water out as much as possible, you may need to do this a few times. I place the cucumber in paper towels, squeeze the water out and change the paper towels as needed. Drizzle with some hight quality olive oil before serving. 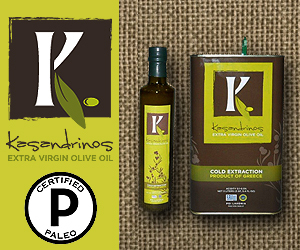 I recommend Kasandrinos extra virgin Greek olive oil. You can serve this immediately but it tastes best when its had time to chill in the refrigerator for a few hours or overnight. Dip for pita bread, flat bread or crackers whatever fits your bariatric diet!